The former home of Johnny Carson in Malibu, California, has a pool, tennis court and fitness center overlooking Point Dume Marine Reserve. Johnny Carson’s Malibu estate, which is owned by Philadelphia native film producer, fashion mogul, and philanthropist Sidney Kimmel, has taken a whopping 20 percent off its asking price, the Los Angeles Times reports. The asking price is now $65.2 million, which is still quite a bit of money. 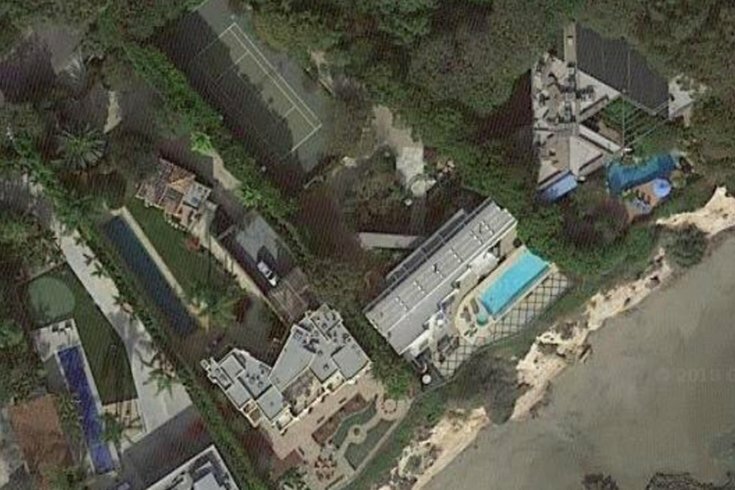 The late “Tonight Show” host had lived in the 4-acre oceanfront property for over 20 years before passing away in 2005. Carson purchased the estate in 1984 for roughly $9.5 million, according to the Times. The Kimmel family acquired the home from Carson’s widow in 2007 for $46 million. The main house measures 7,083 square feet, with a 843-square-foot guest house, a tennis court, an indoor arboretum, a swimming pool and a koi pond, and plenty more. It overlooks the Point Dume State Marine Reserve. You can find the listing's brochure here, and you can find more photos of the property at its Coldwell Banker web page. Kimmel’s history of donating to his hometown is well-documented. Through his foundation, the Sidney Kimmel Foundation, he’s donated millions to Thomas Jefferson University, the Kimmel Center for the Performing Arts, the National Constitution Center, and the National Museum of American Jewish History. Kimmel, 90, is worth $1.3 billion according to Forbes.